The USS Hatteras images are being released this month to coincide with the 150th anniversary of the battle where the 210-foot ship was lost about 20 miles from Galveston. They show previously unknown details like a paddle wheel, the stern and rudder—and a shell hole that may have been among the ship's fatal wounds. 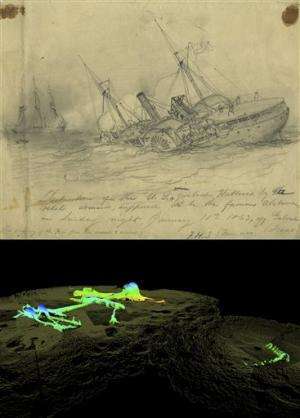 Archaeologists and technicians spent two days last September mapping the wreckage with sonar imaging technology. Project manager Jim Delgado, of the National Oceanic and Atmospheric Administration, says the images allow views no diver can get because of the murky water. America's coming civil war will be more interesting.